Other guests that attended highly eclectic evening included, Hon Tony Burke MP – Member for Watson, Hon Richard Marles MP Shadow Minister for Immigration, Hon Michelle Rowland MP, Ms Kaila Murnain NSW Labor Secretary, Mark Lennon NSW ALP President, Mark Morey Secretary Unions NSW, Alex Claassens Secretary RBTU along with state MP’s Jodi McKay, Sophie Costsis, Shaoquett Moselmane and Guy Zanghari. Amarinder Bajwa, Secretary Subcontinent Friends of Labor formally opened the evening and welcomed the guests. Mahendra Lamsal and Shoaib Shams hosted an elaborate mix of cultural programs. 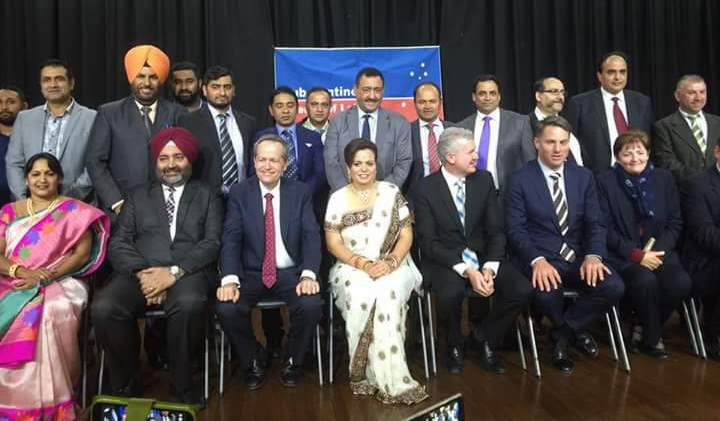 Dr Moninder Singh, President Subcontinent Friends of Labor welcomed the dignitaries and highlighted the ongoing support of subcontinent communities for Labor in the upcoming federal elections. Aruna Chandrala, Chair women’s committee delivered a heartfelt speech on the success of migrant communities. Blacktown, Mayor Stephen Bali welcomed the Leader of Opposition in his Council. 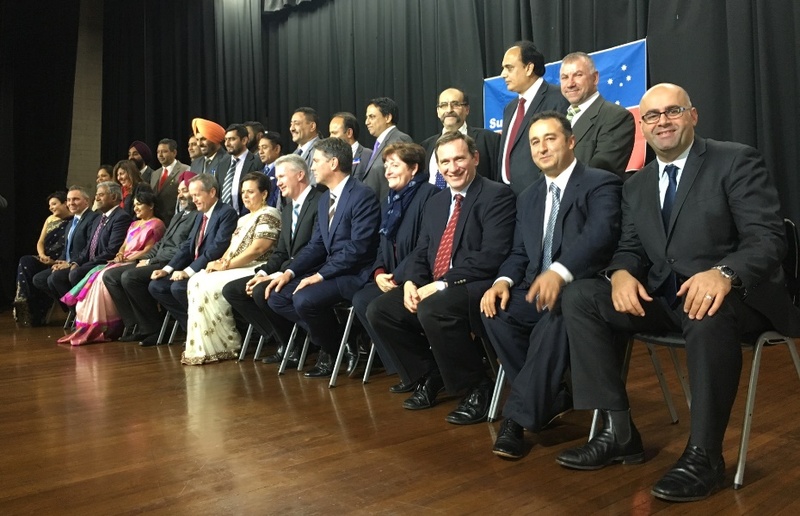 The Mayor Bali highlighted the valuable contribution of the subcontinent people in his local Council, He admired the growth and multicultural environment of in Blacktown. ony Burke MP introduced Bill Shorten MP to the audience and emphasised the role of the communities to support Labor. Mr Ejaz Khan, Vice President of SFOL was the MC of the formal part of the event. He also acknowledged the attendance of Lal Wickrematunge Consul General of Sri Lanka and Deepak Khadka Consul General of Nepal who attended with the community members. 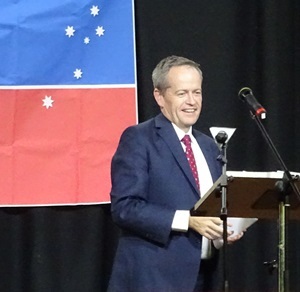 Hon Bill Shorten in his speech highlighted the Labor values and key issues of health, education, economy. ‘Vote Labor if you do not want cuts to the Medicare, Vote Labor if you do not want cuts to education, Vote Labor if you want better services at the hospitals’ he reiterated. Bill Shorten MP acknowledged the contribution of multicultural Australians and said that under Labor ‘Racism’ has no place and a new human rights campaign would be started named ‘Racism stops with me’. He added that under a Labor government families will not be charged $125,000 to visit and stay with their grandchildren. 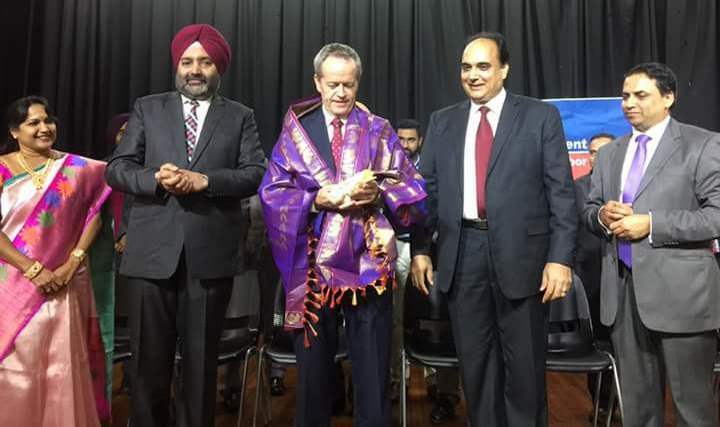 Bill Shorten said that Labor party welcomes people from the subcontinent for their commitment to education, work ethics, love for neighbourhood and commitment to the faith. Many communities supported this event that included Multicultural Communities Council of NSW, Indian Crisis Support Agency, Sri Guru Singh Sabha, Revesby Sikh Temple; Lions Club Blacktown, Ahmadiyya Muslim Association Blacktown, Punjabi Council, Australian Sikh Council, Global Women’s Network, Unions NSW, Islamic Association of Blacktown and Pakistan Association. Kenrick Cheah, Community Relations Director; NSW Labor Party and members of young Labor attended the event. A number of ethnic media also attended and supported the event, these included SBS Punjabi, SBS Urdu, Indian Down Under, Rabitah, Sada e Watan, Navtarang, Punjabi Tribune (India), Daily Ajit Jalandhar (India), Jagbani (India), The Punjab Herald Sydney, Punjab Express, Punjab Times, Radio SWR, Nepali Times, Asia Times, Desi Australia and Hindi Gaurav.